Earlier this week, news broke out on SDNCentral about a new startup called SocketPlane that integrates Docker containers with Open vSwitch (OVS). Docker is one of the hottest areas in enterprise tech these days. At the OpenStack SV event last month, Mirantis CEO Adrian Ionel, said that Docker had had 20 million downloads in the past four months mainly due to its ease of use and its benefits to developers. 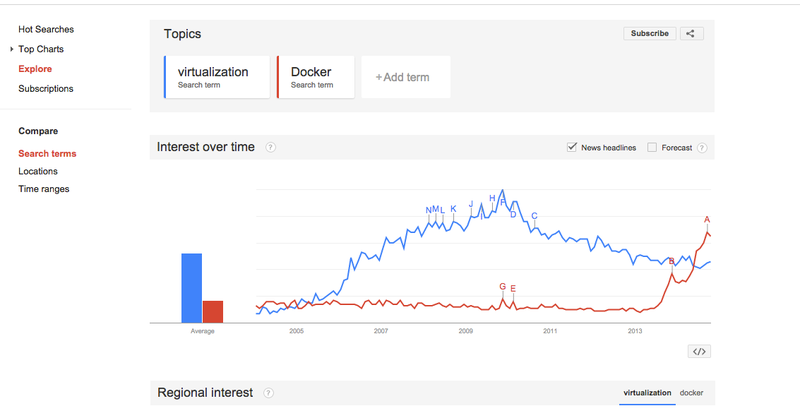 He showed a screenshot of Google Trends with ‘Docker’ compared against ‘Virtualization’. That picture is recreated below. One of the co-founders of SocketPlane is Brent Salisbury, who has a network engineering background in academia before joining Red Hat earlier this year. In recent years he got more involved in the Open Daylight (ODL) project and is arguably the most well known network engineer-turned-coder. His blog has a wealth of information on hands on guides for installing and integrating OVS, OpenStack, and ODL, which I’ve referred to frequently. Two other prominent contributors to ODL, Madhu Venugopal and Dave Tucker, are the other co-founders of SocketPlane. I had listened to a Class C Block podcast on ODL in November 2013, in which Venugopal and Salisbury spoke at length of their involvement with the project. Definitely worth a listen if you have the time.